More than 8,000 people are bitten by venomous snakes every year. That statistic might frighten you, but even scarier is the thought that most of those 8,000 people weren’t even outside. There are over 20 different venomous species of snakes in the United States and their venom can have deadly consequences. From Rattlesnakes to Cottonmouths, there are snakes with venom so powerful that you can actually see it eat away at your flesh and muscle as you watch it. So, how do you protect yourself from a trip to the hospital, a gnarly amputation, or worse—death? Well, you can pick up a quality pair of snake proof boots to protect you from those venomous fangs! You know that snake proof boots are beneficial, but with so many on the market, how do you even know what constitutes a good pair of snake proof boots? Well, the first thing you want to look at is coverage. Snakes usually strike the foot or lower leg, so choosing a boot with a high shaft that stretches above the ankle is a good choice. You also want to make sure you choose snake proof boots made out of the right materials so the fangs cannot penetrate and inject venom. The most common quality materials are synthetic weaves, cordura nylon, leather, denim, and Kevlar. You’ll also want boots that are comfortable to wear so look for boots that have flexible points and are less rigid. Finally, you’ll also want to look at how boots close. Zippers are common for quick and easy closure, but these can often get caught on twigs and brush. Slip on boots are another option, but these can be less comfortable and snug-fitting, which is not good. A boot with a combination of closures like Velcro straps with zippers or slip-ons can be a good option. Now that you know what to look for in the top snake proof boots, it’s time to choose the best pair for you. There are countless versions available in today’s market, but we did the work for you and narrowed it down to the top 10 most comfortable snake proof boots. For those wanting a snake proof boot, the Lacrosse Men’s Alphaburly Pro SZ 18 RTXT 1000 Hunting Boot is certainly high ranking on the list. This rubber hunting boot combines high-quality, scent-free rubber and is actually coated with a naturally insulating neoprene on the inside for added comfort and warmth. The Lacrosse Men’s Alphaburly Pro SZ 18 RTXT 1000 Hunting Boot also features an EVA midsole that provides more comfort for the long hours spent hunting and traversing through the forest. 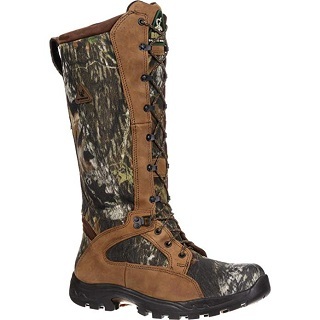 The Lacrosse Men’s Alphaburly Pro SZ 18 RTXT 1000 Hunting Boot is designed with durability and flexibility in mind. It also comes with a neoprene gusset on the back that adjusts to different calve sizes so you can get a snug, secure fit. 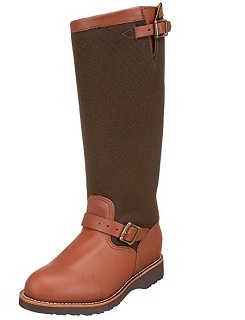 These waterproof boots also feature an 18” shaft so you will be well protected. If you are looking for a quality snake proof boot, the Lacrosse Men’s Alphaburly Pro SZ 18 RTXT 1000 Hunting Boot delivers. If you are looking for quality snake proof boots, the Irish Setter Men’s 2875 Vaprtrek Waterproof 17″ Hunting Boot is a good option. 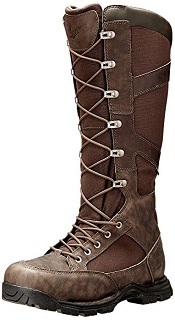 The pair of boots are specifically designed for hunters and will keep you safe from venomous fangs. The Irish Setter Men’s 2875 Vaprtrek Waterproof 17″ Hunting Boot features a 17” shank, which is a good height to keep you protected. In addition, the Irish Setter Men’s 2875 Vaprtrek Waterproof 17″ Hunting Boot is also 40% lighter than other boots on the market so you’ll feel light on your feet for hours. They also feature an RPM composite sole that adds even more comfort. You can also look forward to easy lacing up with their need speed lacing system with abrasion resistant toes. 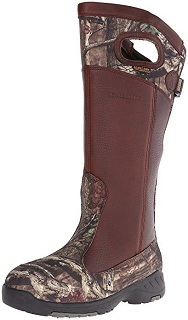 Finally, the Irish Setter Men’s 2875 Vaprtrek Waterproof 17″ Hunting Boot also comes with ScentBan tech. This proprietary feature is added to their leather materials and liners to kill odor causing bacteria and conceal your scent from snakes. For great snake proof boots, the Irish Setter Men’s 2875 Vaprtrek Waterproof 17″ Hunting Boot is certainly a good option. For snake proof boots, the MuckBoot Pursuit Men’s Rubber Snake Boot is one to consider. That’s because the MuckBoot brand name is certainly nothing to scoff at. This brand of boots is designed for comfort in messy conditions and the MuckBoot Pursuit Men’s Rubber Snake Boot are no exception. 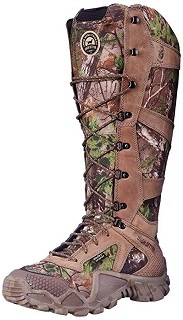 These boots are fully camouflaged and great for hunting. 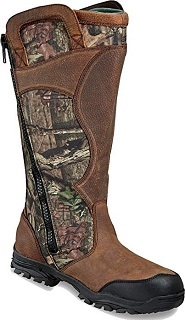 In addition, the MuckBoot Pursuit Men’s Rubber Snake Boot is also completely waterproof. Despite it being designed for maximum protection from snake bites, these boots are also very flexible. This makes them comfortable for even the long days spent out in the woods. Made from leather and fabric, the MuckBoot Pursuit Men’s Rubber Snake Boot also has flexible neoprene layers to keep your feet warm and XPressCool technology to keep your feet sweat and odor-free. The combination of quality features makes the MuckBoot Pursuit Men’s Rubber Snake Boot one of the best on the market. Another good option for snake proof boots is the Lacrosse Men’s Adder 18” Snake Boot. The great thing about these snake proof boots is that laces won’t slow you down. The Lacrosse Men’s Adder 18” Snake Boot comes with no laces of zippers. You simply pull them on and quickly adjust the calf strap to find the perfect fit. This also means you won’t need to worry about brush and twigs clinging to laces, zippers or Velcro. In addition to being the easiest boots to pull on and off, the Lacrosse Men’s Adder 18” Snake Boot features an 18” shaft, EVA midsole and PU footed to keep you safe and comfortable. Another benefit of the Lacrosse Men’s Adder 18” Snake Boot is breathable to allow moisture to escape, which keeps your feet dry. This eliminates odors caused by sweating and decreases the likelihood of a snake attack. For a good quality pair of snake boots, the Lacrosse Men’s Adder 18” Snake Boot is one to consider. The Lacrosse Men’s Venom Scent APG HD Snake Boot is another good option to consider when looking for the best snake proof boot. These boots are especially great for hikers and will protect you from deadly snake bites while you’re hitting the trail. The Lacrosse Men’s Venom Scent APG HD Snake Boot is lightweight and flexible, which is why they are great options for hiking. 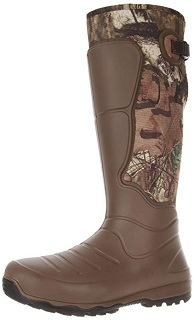 In addition, the Lacrosse Men’s Venom Scent APG HD Snake Boot is also waterproof to keep your feet dry. Their outsole is designed to provide traction in any environments so you will also be sturdy on your feet. They also feature an EVA midsole and PU foot bed for increased comfort while you’re trekking in the woods. With 360 degree snake bite protection, the Lacrosse Men’s Venom Scent APG HD Snake Boot is one of the best snake proof boots money can buy. As far as snake proof boots go, the Chippewa Men’s 17″ Pull On 23913 Snake Boot is yet another to consider. These boots might not win any fashion contests with its smooth brown leather look, but they’ll certainly keep you safe from snake bites. Used by both hunters and hikers, the Chippewa Men’s 17″ Pull On 23913 Snake Boot is a versatile boot that offers great bite protection. These boots have an added level of comfort and are built to last with rugged Goodyear welt construction. They’re also made in the USA so you can rest assured of their strong quality. These boots pull on, so you also don’t need to worry about zippers or laces catching twigs and brush as you made your way through the woods. With Vibram rubber outsoles that provide traction and comfort, the Chippewa Men’s 17″ Pull On 23913 Snake Boot has just what you need. The Rocky Waterproof Snakeproof Hunting Boot is another solid option for snake proof boots. 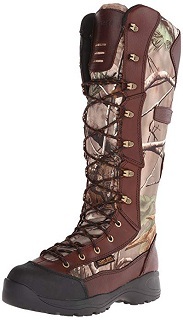 These boots are camouflaged to make them a great option for hunters. They offer a 16” shaft to keep you protected from snake bites. Rocky is a high quality brand when it comes to boots and the Rocky Waterproof Snakeproof Hunting Boot does not differ from that line of quality. In addition to being waterproof to keep your feet dry, they are also very comfortable to wear. With a synthetic sole, your feet will be comfortable throughout the duration of your hunting escapades. The polyurethane and rubber outsole also provides quality traction that will keep you surefooted on even the slickest of environments. The Rocky Waterproof Snakeproof Hunting Boot is also slip on, which means it’s extremely easy to pull on and off. For a high quality hunting boot that will keep you safe from snake bites, the Rocky Waterproof Snakeproof Hunting Boot is definitely one on the list to consider. 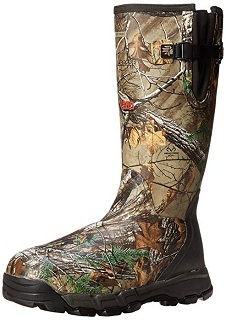 For snake proof boots you should also look into the Thorogood Men’s Snake Bite 17″ Waterproof Hunting Boot. That’s because these boots are great for those adventuring outside and hunting. They feature a 17” shaft for snake bite prevention even up your calf and are extremely durable as well. Featuring a side zipper, the Thorogood Men’s Snake Bite 17″ Waterproof Hunting Boot is also extremely comfortable. 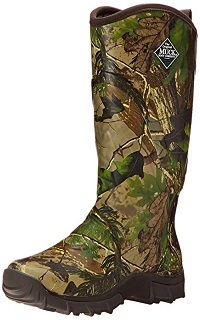 These camouflaged boots have an EVA midsole and PU foot bed for increased comfort and they also offer support with a layer of polyurethane cushioning. With cement construction, you can also rest assured that the Thorogood Men’s Snake Bite 17″ Waterproof Hunting Boot is built to last. They also come with rubber Z-track outsoles to provide exemplary traction. When it comes to snake bites, these boots have a construction to keep you safe. Featuring 3M Scotchguard Protection and X-Stream waterproof technology, the Thorogood Men’s Snake Bite 17″ Waterproof Hunting Boot are some of the best snake boots money can buy. If you are looking for lightweight boots that are snake proof to wear while hunting, the Lacrosse Men’s AeroHead 18” 3.5mm Hunting Boot should be on your list to consider. These full-length boots have an 18” shaft and are designed to provide exemplary traction in any type of weather conditions. With a combination of nylon and rubber, the Lacrosse Men’s AeroHead 18” 3.5mm Hunting Boot will provide snake bite protection to keep you safe. In addition, these boots are also comfortable and flexible. They feature a closed-cell foam insole liner to add extra cushion. Not only does the closed-cell foam insole offer added support, they are also springy and moisture proof. This helps for those long walks through the woods after a long day spent hunting. With a bevy of great features, the Lacrosse Men’s AeroHead 18” 3.5mm Hunting Boot is certainly snake proof boots that you should consider during your search. From the quality brand name of Danner comes the Danner Men’s Pronghorn Snake Side-Zip Hunting Boot. These boots are built to last and will keep you safe from venomous snake fangs. Made entirely from leather, the Danner Men’s Pronghorn Snake Side-Zip Hunting Boot offers durability and comfort. With rubber outsoles perfect for the slipperiest and wettest conditions, these rugged boots are great. In addition to being completely immune from snake bites, these boots are also extremely light. They feature a Gore-Tex lining to keep your feet dry and odor-free. This is essential for keeping snakes at bay. These boots are also extremely easy to take on and off with a side zip feature and lace up options to provide the most secure fit possible. The shaft is only 15.5”, which is shorter than most others, but still enough to provide the protection you need. If you want a quality pair of snake proof bites, the Danner Men’s Pronghorn Snake Side-Zip Hunting Boot is a solid option. The important thing to remember is that no matter what boot you choose, the main criteria is that they protect you from venomous snakes. All of the boots on this list have the necessary features to keep you safe from those dangerous fangs while hunting, working, or hiking.